Last year, Christina Quasney was close to giving up. A biochemistry major at the University of Maryland, Baltimore County, Quasney's background was anything but privileged. Her father runs a small car-repair shop in the tiny community of Millersville, Maryland, and she was the first person in her immediate family to attend university. At the age of 25, she had already spent years struggling to make time both for her classes and the jobs she took to pay for them, yet was still far from finishing her degree. “I started to feel like it was time to stop fighting this losing battle and move on with my life,” she says. Quasney's frustrations will sound familiar to millions of students around the world. Researchers like to think that nothing matters in science except the quality of people's work. But the reality is that wealth and background matter a lot. Too few students from disadvantaged backgrounds make it into science, and those who do often find that they are ill-prepared owing to low-quality early education. Few countries collect detailed data on socioeconomic status, but the available numbers consistently show that nations are wasting the talents of underprivileged youth who might otherwise be tackling challenges in health, energy, pollution, climate change and a host of other societal issues. And it's clear that the universal issue of class is far from universal in the way it plays out. Here, Nature looks at eight countries around the world, and their efforts to battle the many problems of class in science. Quasney is lucky by global standards. She lives in an exceedingly rich country that is brimming with educational opportunities and jobs. Yet for students who share her struggles to make ends meet, the US higher-education system can pose one obstacle after another. “It starts in high school,” says Andrew Campbell, dean of the graduate school at Brown University in Providence, Rhode Island. Government-supported early education is funded mainly at the state and local level, he notes, and because science courses are the most expensive per student, few schools in the relatively poor districts can afford to offer many of them. Students from these districts therefore end up being less prepared for university-level science than are their wealthier peers, many of whom attended well-appointed private schools. That also puts the students at a disadvantage in the fiercely competitive applications process: only about 40% of high-school graduates in the lowest-income bracket enrolled in a university in 2013, versus about 68% of those born to families with the highest incomes. The students who do get in then have to find a way to pay the increasingly steep cost of university. Between 2003 and 2013, undergraduate tuition, fees, room and board rose by an average of 34% at state-supported institutions, and by 25% at private institutions, after adjusting for inflation. The bill at a top university can easily surpass US$60,000 per year. Many students are at least partly supported by their parents, and can also take advantage of scholarships, grants and federal financial aid. Many, like Quasney, work part time. Nonetheless, some 61% of US students earning bachelor's degrees graduate with some debt — US$26,900, on average. For those who go on to graduate programmes, tuition is usually paid for by a combination of grants and teaching positions. But if graduate students have to worry about repaying student loans, that can dissuade them from continuing with their scientific training. Several initiatives are under way around the country to ease the way for science students from disadvantaged backgrounds, among them is the $14-million INCLUDES programme announced earlier this year by the US National Science Foundation. But for students such as Quasney, staying in science can still be a matter of luck. It is no accident that China currently produces more science PhDs than any country in the world. To combat large-scale poverty, especially in the interior provinces, the communist government in Beijing is trying to make education equally available to everyone. To help the poor, for example, Beijing sets tuition fees low and forbids raising them. Just 5,000 yuan (US$750) per year is enough for entry into premier institutions such as Tsinghua University in Beijing. And for those unable to come up with that sum, the country has national scholarship programmes, including tax-free loans and free admission. Meanwhile, to help integrate China's 55 ethnic minorities, which are also often poor, most provinces give bonus points to minority students who take the Gaokao: a university entrance examination that is the most important threshold to pass on the way to an academic career. A quota system ensures that students from remote regions such as Xinjiang and Tibet are represented at elite schools. China even has 12 universities that are dedicated to minorities. Beneath the surface, however, the reality of Chinese science often falls short of its egalitarian ideals. Children of senior government leaders and private business owners account for a disproportionate share of enrolment in the top universities. And students hesitate to take on the work-intensive career of a scientist when easier, and usually more lucrative, careers await them in business. According to Hepeng Jia, a journalist who writes about science-policy issues in China, this is especially true for good students from rich families. As a result, says Jia, scientists usually come from poorer families, get less support from home and work under a heavier financial burden. The situation is exacerbated by the low salaries, he says. The average across all scientific ranks is just 6,000 yuan per month, or about one-fifth of the salary of a newly hired US faculty member. Things are especially tough for postdoctoral researchers or junior-level researchers “who can hardly feed their families if working in bigger cities”, says Jia. This leads many scientists to use part of their grants for personal expenses. That forces them to make ends meet by applying for more grants, which requires them to get involved in many different projects and publish numerous papers, which in turn makes it hard to maintain the quality of their work. Many Chinese researchers escape that trap by seeking positions overseas. Thousands of postdoctoral researchers will go abroad in 2016 with funding from the China Scholarship Council, and many more will find sponsors abroad to fund them. But China has also been able to lure some of the most prominent of these researchers back home. Cao Kai, a researcher at the Science and Technology Talent Center of the science ministry in Beijing, released a survey in April that found one such returning scientist was rewarded with a stunningly high annual salary of 800,000 yuan. But that is not the norm, Kai says. It was just one extreme case he and his colleagues raised to convince “the government to raise the salary of professors at public universities”. That, he says, would go a long way to attracting and retaining talent in science, regardless of social background. 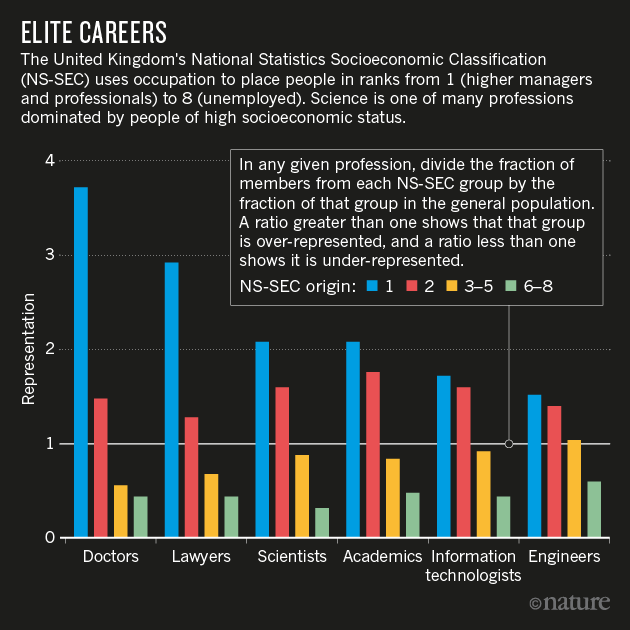 For the most part, science in the United Kingdom is egalitarian — for those who have already made it their career. A 2016 study found that, unlike in law or finance, researchers from lower-income backgrounds are paid no less than their more advantaged peers (D. Laurison and S. Friedman Am. Soc. Rev. 81, 668–695; 2016). One hurdle is aspirational. In an ongoing, 10-year study, a group from King's College London found that most English 10–14 year olds find science interesting. But those from working-class backgrounds rarely saw it as a career — perhaps because they seldom encountered people in science-related jobs (ASPIRES: Young People's Science and Career Aspirations, Age 10–14 King's College London, 2013). To tackle this, the King's team is working with London schools on a pilot programme to show children aged 11 to 15 how science fits into everyday life — by examining the chemicals in food, for example — and how science skills are relevant in a range of jobs. Early results are promising, and the team plans to expand the programme next year. Another barrier could be that UK students who are interested in a science career often need to abandon other subjects at the age of 16. “People from lower-income backgrounds who are unaware of the range of possible science careers might see it as a high-risk gamble,” says Mathieson. A third issue is the effect of a sudden trebling of annual university fees to £9,000 (US$12,000) in 2012. “I suspect that fees could be a massive deterrent to those who grow up in families that have to worry about the basic level of income,” says Mathieson. In Japan, inequalities in wealth and status do not reach the extremes found in China and India. Nonetheless, graduate education and academic research have become less attractive options over the past decade, especially for the underprivileged. Some warn that this could make research a preserve of the wealthy — with grave social costs.“It is an emerging issue in Japan,” says Yuko Ito, who researches science policy at the Japan Science and Technology Agency in Tokyo, a major science funder. A big part of the problem is the rise in tuition fees: even at the relatively inexpensive national universities, the ¥86,000 (US$840) in entrance and first-year tuition fees students paid in 1975 would make little dent in the ¥817,800 they've been paying since 2005. In addition, thanks to Japan's long economic contraction, parents are chipping in 19% less for living costs on average than they did a decade ago. This leaves students increasingly dependent on 'scholarships' — which in Japan are mainly loans that need to be paid back. Half of all graduate students have taken out loans, and one-quarter owe more than ¥5 million. “Many students just can't come up with the tuition and living costs to become researchers,” says Koichi Sumikura, a professor of science policy at the National Graduate Institute for Policy Studies in Tokyo. The government has taken stock of the issue. A government plan for 'investment in the future', announced on 2 August, promises to increase funding for scholarships that need not be repaid as well as to boost the availability of tax-free student loans. But the government has yet to take up a more specific examination of the relationship between success as a researcher and economic factors, says Sumikura. “That will be an important topic in the future,” he says. In Brazil, inequalities in wealth are extreme by almost every measure — including education. The government-run schools are so bad that they are avoided by all but the poorest families. As recently as 2014, just 57% of the country's 19-year-olds had completed high school. And yet there are signs of progress, especially in science, technology, engineering and medicine. In 2011, for example, Brazil created Science Without Borders, a programme to send tens of thousands of high-achieving university and graduate students to study abroad. Because students from wealthier families have by far the best primary and secondary education, they might have been expected to dominate the selection process. But by the end of the first phase this year, more than half of the 73,353 participants had come from low-income families. “These statistics really caught us all by surprise,” says Carlos Nobre, a climate scientist who formerly headed of one of the public foundations that fund Science Without Borders. In São Paulo, meanwhile, the medical school at the prestigious University of Campinas (UNICAMP) gives preference to admitting gifted students from government-run schools. The programme started in 2004 after research suggested that out of those with similar test scores prior to admittance, predominantly poor government-school students tended to perform better at UNICAMP than did their counterparts from private schools. The former comprised 68% of this year's entering class. 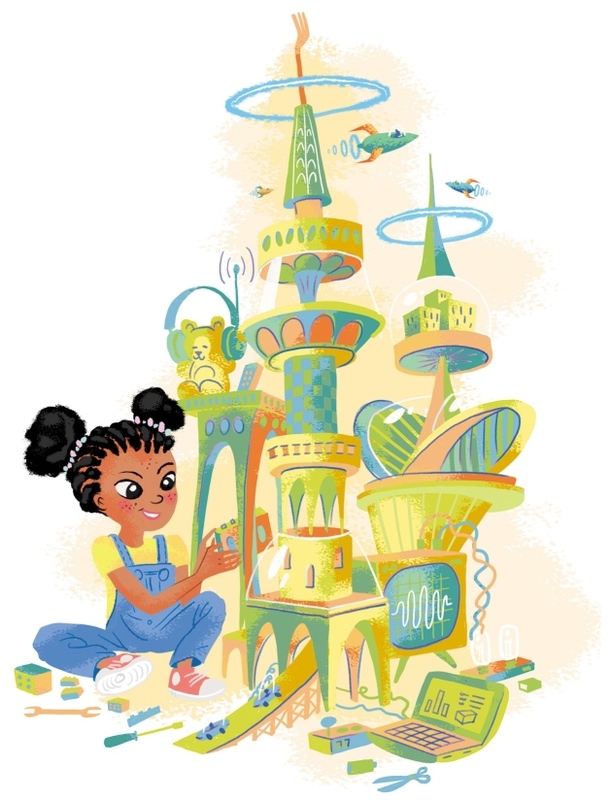 Brazil may also be seeing the fruits of the government's effort to improve scientific literacy and push more students into science careers, which gained momentum after the inauguration of Luiz Inácio Lula da Silva as president in 2003. A division at the federal Ministry of Science, Technology and Innovation focuses entirely on 'social inclusion', with programmes to improve public schools and promote research in fields that affect local communities, such as nutrition and sustainability. Despite the renown of technology hubs such as Bangalore and universities such as the multicampus Indian Institute of Technology, vast numbers of talented students in India never get to realize their full potential owing to poor rural schools, language barriers and the caste system. Especially outside the cities, higher education — including science — largely remains a privilege of the rich, the politically powerful and the upper castes. India's national census does not collect data on caste, rural or gender representation in science, nor do the country's science departments. Nonetheless, says Gautam Desiraju, a chemist at the Indian Institute of Science in Bangalore, it is clear that rural Indian students are hampered by a lack of good science teachers and lab facilities, and are unaware of opportunities to enter mainstream science (see www.nature.com/indiascience). The barriers are even higher for rural girls, who are discouraged from pursuing higher studies or jobs, and for girls from poor urban families, who are expected to take jobs to contribute to their dowries. Many rural students are also hampered by their poor English, the language that schools often use to explain science. “Teachers from elite colleges and interview and selection committees are often biased against such students,” says immunologist Indira Nath, at the Indian National Science Academy in New Delhi. Caste — the hereditary class system of Hindu society — is officially not an issue. India's constitution and courts have mandated that up to half of the places in education and employment must be reserved for people from historically discriminated-against classes. However, a clause excludes several of India's top science centres from this requirement. And in reality there is an “unintentional, subtle or hidden discrimination against students from reserved categories, right from high school to college levels”, says Shri Krishna Joshi, a scientist emeritus at the National Physical Laboratory in New Delhi. Teachers do not encourage them as much as they do students from upper castes. As a result, he says, “poor students from reserved categories in turn often have psychological barriers and believe they cannot compete with the others”. Still, says Desiraju, there are signs of progress. For a long time, Indian officials assumed that all they had to do was set up centres of scientific excellence and the effects on education would simply trickle down to the masses. “But now,” he says, “agencies are beginning to adopt a more bottom-up approach” that seeks to find talented people at the lowest economic levels. At the University of Delhi South Campus, geneticist Tapasya Srivastava sees the effects of that shift. “Competitiveness for higher science education is increasing across all caste-based categories and gaps are dissolving,” she says. 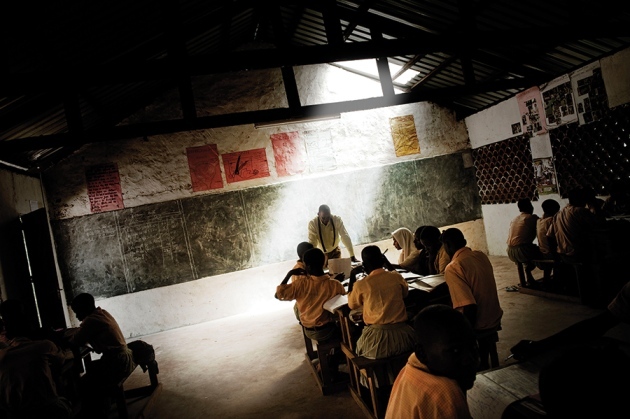 Poor students from Kenya are often interested in science, but struggle to make it a career. In Kenya, where around 40% of the population lives on less than US$1.25 a day, class matters surprisingly little for who makes it into science. As one of Africa's fast-growing 'lion' economies, the country has seen university enrolment more than double since 2011, reaching more than 500,000 last year. The government subsidizes tuition fees for poor secondary-school students who get good grades in science, and there are loans available to help them with living expenses. At the postgraduate level, however, the lack of opportunities in Kenya means that many science hopefuls have to do part of their training abroad. “The problem for me wasn't getting into science, it was staying in,” says Anne Makena, a Kenyan from a lower-class background with an undergraduate degree in biochemistry from Moi University in Eldoret. She now has a Rhodes scholarship to finish her PhD in chemical biology at the University of Oxford, UK. For those staying at home, the surest path to a research career is to get a job with foreign-funded organizations such as the International Centre of Insect Physiology and Ecology (ICIPE) in Nairobi, or the partnership between the Kenya Medical Research Institute (KEMRI) and the UK Wellcome Trust. But competition is fierce, and it can take years to get accepted. This is when graduates from a poorer background are more likely to give up, says Makena. They are drawn by lucrative private-sector salaries and mindful of the need to contribute financially to their families, whereas wealthier students can afford to wait. Another source of uncertainty is Kenyan universities' struggle to secure enough operating funds from the government. The shortfall has led vice-chancellors in the country's public universities to propose up to a five-fold rise in tuition fees for resource-intensive courses, including science. If this happens and government subsidies do not keep pace, poorer students might forego science courses for cheaper degrees. That would be a pity, says Baldwyn Torto, head of behavioural and chemical ecology at ICIPE, because Kenyan students from modest backgrounds make excellent scientists in his experience. “You find kids from poorer families performing equally well, if not better, than kids from wealthier families,” he says. Following the Soviet Union's collapse in 1991, Russia was quickly given over to untamed capitalism and increasing inequity. Yet the country retained its socialist ideals in education: even now, Russia produces a large share of its science students and researchers from low- and middle-income backgrounds. “There is a national consensus in Russia regarding the value of equal opportunities in education for the modernization of our country,” says Dmitry Peskov, who directs the young professionals division of the Moscow-based Agency for Strategic Initiatives, which promotes economic innovation in Russia. The country hosts some 3,000 universities and higher learning institutes, and about half of its secondary-school graduates go on to attend them. The average among all Organisation for Economic Co-operation and Development countries is about 35%. In peripheral regions such as the Urals or Siberia, where local governments are keen to develop scientific and engineering capacity, teachers identify talented students as early as ages 4 to 6. If they continue to show promise, they are encouraged to enrol at local universities, whose tuition-free programmes may focus on local needs such as agricultural technology. Children who demonstrate exceptional skills in science, art, sports or even chess may earn admission to the Sirius educational centre in Sochi on the Black Sea. This centre, backed by Russian president Vladimir Putin, was set up after the 2014 Winter Olympics to help Russia's most gifted youths develop their talent with support from leading scientists and professionals. Since December 2015, prospective students who succeed in local or national science competitions and maths Olympiads can also hope to secure a presidential grant worth 20,000 roubles (US$307) per month. These grants allow hundreds of students from lower social backgrounds to study at the nation's top universities on the sole condition that they will stay in Russia for at least five years after graduation. But despite such efforts, Russia's science output remains relatively low. One reason, Peskov says, is the Russian science community's isolation. For all their skills and social diversity, Russian researchers tend to speak poor English and are underrepresented in international meetings and collaborations. Uncertainty over the Russian government's future support of science adds to the problem. “Lucrative jobs in finance, business administration or industry are much more popular among well-trained young Russians than is a risky academic career,” he notes. A special issue explores the study of inequality, and how socio-economic divides affect the science workforce. In every society on Earth, at least some fraction of the citizens find their talents being sacrificed to poverty, prejudice, poor schooling and lack of opportunity. Science is comparatively open: many top-rank inventors and researchers have risen from humble beginnings through a combination of brilliance and luck. Even so, the field is losing out on millions of bright but underprivileged students. And now that researchers have begun to grapple with ways to increase gender and ethnic diversity in science, many are calling for socio-economic status to be the next big topic of debate. This issue of Nature contributes to that conversation with a look at what research can say about inequality as a phenomenon, as well as an examination of how it plays out in science. Economist Branko Milanovic uses historical data to follow the ebb and flow of inequality on a timescale of centuries. He concludes that the striking global increase in inequality since the early 1980s will turn around at some point — driven either by comparatively benign historical forces such as technological change, or by malign events such as war or plague. Economist Mike Savage takes on the surprisingly fraught question of what 'class' actually means. Definitions have historically centred on people's income or occupation, but, more recently, sociologists have argued for incorporating an individual's cultural and social capital — the connections that he or she can parlay into better education and jobs. The difference could influence how governments shape programmes to address inequality. Two News Features look at inequality within research itself. One examines how class and inequality are affecting science and scientists in eight countries around the world, and finds that even the richest countries still struggle with the issue. The other examines salary data for scientists in several countries, and finds that there is a growing gap between top earners and the rest. These data back up the findings from Nature's annual salary survey, which reveals that many scientists think they have made an economic sacrifice for their career. A notable proportion say that their job prospects are worse than those of past generations, and many would not recommend a career in research to young people. On the subject of inequality, it seems, science still has a lot of work to do. In late May, eight employees of Mayo Clinic's medical-records department packed up their belongings, powered down their computers and moved into a brand new office space in the heart of Rochester, Minnesota. There, they made themselves at home — hanging up Walt Disney World calendars, arranging their framed dog photos and settling back into the daily rhythms of office life. On a warm morning in June, the recording is playing on a loop. “I've timed it,” says Randy Mouchka, one of the relocated office workers, with exasperation. “It's 55 seconds.” Today, the air feels stale and stuffy, but the sun is streaming in — an improvement over last week, Mouchka says, when the researchers kept the window shades pulled all the way down. Brent Bauer explains the idea behind his massively malleable living space. Scientists hope that the lab will allow them to add to the growing literature on the impact of the built environment, and to produce practical, evidence-based recommendations for creating healthier indoor spaces ranging from offices to homes. It's an ambitious mission that will involve integrating and interpreting vast quantities of data. But scientists, companies and organizations — impressed by the lab's size, scope and approach — are eager to see what it finds. “Everybody I've talked to who has heard about it is very excited because it is truly unique,” says Gail Brager, associate director of the Center for the Built Environment at the University of California, Berkeley. Decades of research have revealed that indoor spaces can affect how people think, feel and behave. In a landmark 1984 study1, Roger Ulrich, a pioneer in health-care design research now at Chalmers University of Technology in Gothenburg, Sweden, found that people recovering from surgery in hospital rooms with views of nature needed shorter stays and fewer doses of strong pain medication than did those in rooms looking onto a brick wall. Others have reported that certain kinds of artificial light can improve sleep and reduce depression and agitation in people with Alzheimer's disease2; that higher air temperatures seem to curb calorie consumption3; that employees take more sick leave when they work in open-plan offices4; and that children in daylight-drenched classrooms progress faster in maths and reading than do those in darker ones5. In 2012, the accumulating research led Delos — which aims to create spaces that boost health and wellness — to start developing evidence-based guidelines for healthier buildings. The WELL Building Standard, first released in 2014, outlines more than 100 best practices, from using paints that release minimal levels of potentially toxic compounds to organizing cafeterias so that they prominently display fruit and vegetables. Buildings that meet enough of the standards can become 'WELL Certified', in much the same way that buildings can earn sustainable, eco-friendly certification. 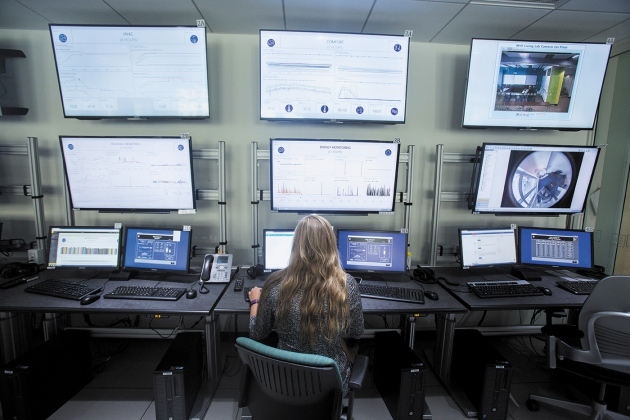 In the Well Living Lab's control room, researchers track dozens of variables, including lighting, temperature, humidity and noise levels. 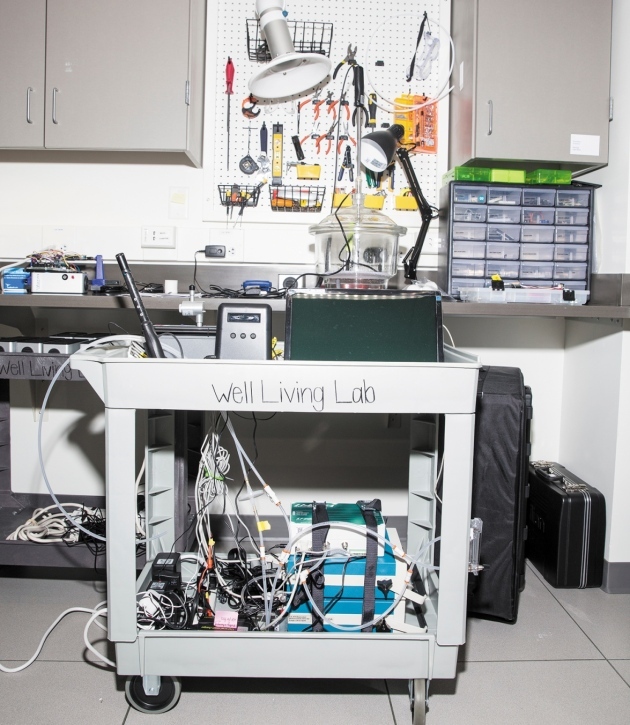 The Well Living Lab's scientists are starting small and simple, drawing on previous findings to create a variety of office environments that they hypothesize will have positive, negative or no effects on workers' comfort and stress. They are monitoring participants' responses to these changing conditions with daily surveys — which ask for ratings of comfort, satisfaction, productivity and stress — and the biometric wristbands. This study is a trial run, designed to validate the lab's systems and approach, as well as the basic idea that office conditions influence employees' well-being. “The world is a multicomponent place, so there's a benefit of doing that — that's how the real world is,” says Mariana Figueiro, who directs the Light and Health Program at Rensselaer Polytechnic Institute in Troy, New York. But there's a danger, too, she says. “Those are probably going to be very expensive studies, and they might be very noisy” statistically, which may make the data difficult to interpret. The lab's leaders still have a long wish list of sensors and technologies that they would like to deploy, and they're eyeing international expansion. They're not alone. 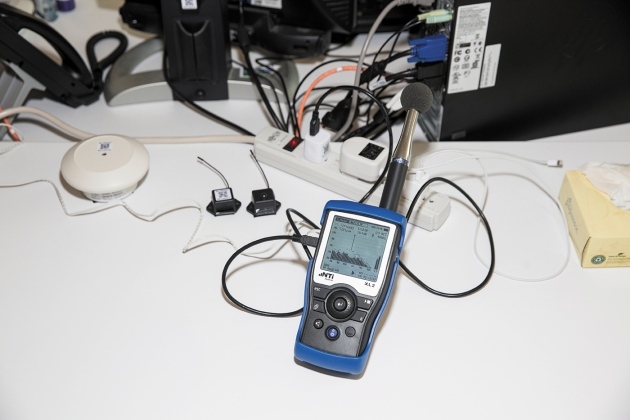 A handful of other teams are taking an immersive, multivariable approach to studying human responses to indoor conditions, using flexible facilities — from the Total Indoor Environmental Quality Lab at Syracuse University in New York, to the SenseLab at the Delft University of Technology in the Netherlands, which should open in December. Bauer says that all proposed studies — including those sponsored by alliance members — will need approval from the lab's leaders, its joint steering committee and Mayo's institutional review board. “I think we've been very clear with the companies that are participating that membership isn't a carte blanche,” he says. Unsure of what to do with Bates, his computer instructor introduced him to Stanley, a researcher well known for his work in psychometrics — the study of cognitive performance. To discover more about the young prodigy's talent, Stanley gave Bates a battery of tests that included the SAT college-admissions exam, normally taken by university-bound 16- to 18-year-olds in the United States. With the first SMPY recruits now at the peak of their careers1, what has become clear is how much the precociously gifted outweigh the rest of society in their influence. Many of the innovators who are advancing science, technology and culture are those whose unique cognitive abilities were identified and supported in their early years through enrichment programmes such as Johns Hopkins University's Center for Talented Youth— which Stanley began in the 1980s as an adjunct to SMPY. At the start, both the study and the centre were open to young adolescents who scored in the top 1% on university entrance exams. Pioneering mathematicians Terence Tao and Lenhard Ng were one-percenters, as were Facebook's Mark Zuckerberg, Google co-founder Sergey Brin and musician Stefani Germanotta (Lady Gaga), who all passed through the Hopkins centre. “In a sense, that brought Julian's research full circle, since this is where he started his career as a professor,” Benbow says as she nears the university's psychology laboratory, the first US building dedicated to the study of the field. Built in 1915, it houses a small collection of antique calculators — the tools of quantitative psychology in the early 1950s, when Stanley began his academic work in psychometrics and statistics. His interest in developing scientific talent had been piqued by one of the most famous longitudinal studies in psychology, Lewis Terman's Genetic Studies of Genius3, 4. Beginning in 1921, Terman selected teenage subjects on the basis of high IQ scores, then tracked and encouraged their careers. But to Terman's chagrin, his cohort produced only a few esteemed scientists. Among those rejected because their IQ of 129 was too low to make the cut was William Shockley, the Nobel-prizewinning co-inventor of the transistor. 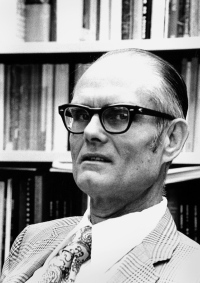 Physicist Luis Alvarez, another Nobel winner, was also rejected. “Setting out to raise a genius is the last thing we'd advise any parent to do,” says Camilla Benbow, dean of education and human development at Vanderbilt University in Nashville, Tennessee. That goal, she says, “can lead to all sorts of social and emotional problems”. Have your child's abilities tested. This can support a parent's arguments for more-advanced work, and can reveal issues such as dyslexia, attention-deficit/hyperactivity disorder, or social and emotional challenges. Skipping grades is not the only option. SMPY researchers say that even modest interventions — for example, access to challenging material such as college-level Advanced Placement courses — have a demonstrable effect. Among students with high ability, those who were given a richer density of advanced precollegiate educational opportunities in STEM went on to publish more academic papers, earn more patents and pursue higher-level careers than their equally smart peers who didn't have these opportunities8. Some insights have come from German studies9, 10, 11 that have a methodology similar to SMPY's. The Munich Longitudinal Study of Giftedness, which started tracking 26,000 gifted students in the mid-1980s, found that cognitive factors were the most predictive, but that some personal traits — such as motivation, curiosity and ability to cope with stress — had a limited influence on performance. Environmental factors, such as family, school and peers, also had an impact. The data from such intellectual-talent searches also contribute to knowledge of how people develop expertise in subjects. Some researchers and writers, notably psychologist Anders Ericsson at Florida State University in Tallahassee and author Malcolm Gladwell, have popularized the idea of an ability threshold. This holds that for individuals beyond a certain IQ barrier (120 is often cited), concentrated practice time is much more important than additional intellectual abilities in acquiring expertise. But data from SMPY and the Duke talent programme dispute that hypothesis (see 'Top of the charts'). A study published this year12 compared the outcomes of students in the top 1% of childhood intellectual ability with those in the top 0.01%. Whereas the first group gain advanced degrees at about 25 times the rate of the general population, the more elite students earn PhDs at about 50 times the base rate. “A high test score tells you only that a person has high ability and is a good match for that particular test at that point in time,” says Matthews. “A low test score tells you practically nothing,” she says, because many factors can depress students' performance, including their cultural backgrounds and how comfortable they are with taking high-stakes tests. Matthews contends that when children who are near the high and low extremes of early achievement feel assessed in terms of future success, it can damage their motivation to learn and can contribute to what Stanford University psychologist Carol Dweck calls a fixed mindset. It's far better, Dweck says, to encourage a growth mindset, in which children believe that brains and talent are merely a starting point, and that abilities can be developed through hard work and continued intellectual risk-taking. Quand la rage de briller dans l'azur d'outre-mer fait loi, quand l'ambition effrénée de vouloir piocher sur les traces des pionniers de la psychanalyse moderne et autres recherches anthropologiques, constituent le bras de levier pour soulever la Planète d'Archimède, il est laissé de percer le secret de cet étudiant en “psy” de la décennie soixante dix (Université Ain El Bey de Constantine /1973), originaire du massif de " l'Ex-Bissy" : zone limitrophe de la commune de Béni Béchir ... quittant un jour son fief et coordonnées d'origine pour la conquête de l'Occident: ce médecin il a la double face indissociable: séduction et rejet un peu à la manière du légendaire artiste et philosophe asiatique des arts martiaux : l’inégalable « Bruce Lee" devenu l'une des vedettes les plus prisées du 20ème siècle et décédé en (1973) mais ne tergiversons pas: à chacun son dada, à chacun sa passion… Démuni socialement, lui le "fils du Pauvre" à l’instar d'ailleurs de l'écrasante population fréquentant l'Arène Universitaire d'alors, mais armé d'une soif au savoir qu'étoffe une dynamique fusant par tous ses pores et qui n'a d'égale que le summum auquel il s'est hissé à la force du biceps, grâce au catalyseur de l'objectif convoité et d'un caractère trempé, le tout additionné à cette humilité caractérisant ces" Accrocheurs infatigables" qui, vaille que vaille, forcent le Destin et se forgent un piédestal de renommée quand on sait l'abondante la Culture et Travaux de Recherches sondant les profondeurs de la civilisation humaine sous ses multiples facettes: évolutive, religieuse, comportementale et pathologique ... mis à la portée d'un lectorat à dimension planétaire par ce Chercheur prônant une doctrine musulmane progressiste en adéquation avec la dynamique spatio-temporelle caractérisant l'essence : philosophique de ce guide spirituel coranique qui se veut universel jusqu'il la fin de la création : " Ce guerrier de la plume, bardé de doctorats, féru de littérature el auteur de (42) livres couvrant les méandres existentiels de la race humaine, n’est autre que notre regretté camarade "Malek Chebel" auquel sa ville natale, " l'ANTIQUE RUSICADE" (que dis-je ! son" ALGERIE IDENTITAIRE" ) doit une fière chandelle au bas mot et surtout une consécration combien méritée à même de transcender le simple rituel d'obsèques protocolaires sans lendemain... Aussi, apprécié et reconnu par les médias étrangers pour sa valeur intrinsèque (méconnue hélas! et comme de tradition, dirait-on) sous la latitude et longitude de son pays d'appartenance (quelle dramatique allégation prémonitoire quand un jour en vacances d’appartenance (quelle dramatique allégation prémonitoire quand un jour en vacances à Skikda, il rétorqua à la question posée que les « Siens » s'aviseraient peut être de l'inviter sur leurs plateaux quand il ne sera plus de ce monde ! . .) Cet Intellectuel imbu de son" Algérianité" déclinant à deux (02) reprises, d'arborer la nationalité proposée par les premières instances du pays d'accueil (La France) n’a cessé pourtant, tout au long de moult émissions télévisées animées notamment par les chaines françaises, de croiser subtilement le fer avec les « Détracteurs et Autres "ennemis jurés" de tout ce qui respire" Islam" adoptant pour ce faire, une méthodologie d’approche et une analyse socio-identitaire d’avant-garde, loin des clichés médiévaux et autres spectres présentant un « Islam meurtrier et contre-nature »… Malek Chebel : Tous ceux qui l'ont connu ou croisé sur les sentiers de la vie: Famille ! cercles d'Amis, sphères scientifiques et gotha lettré, sont séduits par le profil de ce Penseur d’un abord affable, affublé constamment d'un soutire charmeur égayant un faciès franc et illuminé par un regard scrutateur si cher aux hommes de science et aux professionnels de la chirurgie au bistouri ... Suffit- il alors de pleurer tout son soul de chaudes larmes et faire le profil bas devant la dépouille de cette Icône dorant le blason du patrimoine culturel de « Rusicade » et partant de la nation entière, sachant que d'Aucuns ne viennent de découvrir cet emblème national qu’à peine durant la cérémonie des funérailles, arguant en faire de l'existence fort probable de cette manifestation para-normale du sentiment prémonitoire déjà formulée par le défunt ... à travers l'anecdote (qui n'en n'est pas une) citée plus haut. " Que non! notre cher disparu est maintenant absorbé par l'énergie noire cosmique : inaccessible aux confins de « l'Infiniment Grand » (Prions pour que le Tout-Puissant aie son âme en paix). Aussi, il appartient à tout un chacun: Pouvoirs Publics, Gestionnaires de la Culture Nationale, et à -fortiori le Cercle Incompressible / Famille-Amis, de glorifier sa mémoire en perpétuant son œuvre riche d'une quarantaine de livres, auréolée par ce qui mérite d'être un Best -Seller : "1' Islam des Lumières" ... sur la scène culturelle au moins musulmane ... La grande interrogation qui sévit el taraude l’esprit de tout honnête fervent de ce Penseur, demeure notre insouciance endémique à tous d'avoir occulté et placer sous l'éteignoir, cet explorateur tenace des profondeurs généalogiques de la race humaine et du secret de cette énergie renouvelable à l’infini que recèle le message coranique tel que réfléchi par notre chercheur durant au moins une décennie de labeur soutenu. Que faire alors, une fois les obsèques consommées, le rituel officiel accompli, la famille de retour en terre étrangère, les amis Pieux groggy, encore sous le choc ! Brandir génialement les slogans caverneux et les rhétoriques d’anthologie et de circonstances !... le défunt, parti en voyage interstellaire vers un monde aux paramètres multidimensionnels, est sourd à ces gesticulations humaines du monde physique… il n’a besoin ni de paraboles, encore moins d’hyperboles, cela n’est pas apte à ressusciter une âme rappelée par son, créateur conformément au logiciel divin sanctionnant la vie et la mort comme les deux faces de la même médaille. La mémoire du chercheur « Malek Chebel » doit désormais focaliser l’intérêt de la Patrie-Mère, lui qui a animé combien de conférences aux (04) coins de la planète, à travers des universités de renom telles « Berkeley », pour ne citer que ce Temple du savoir scientifique, sans pourtant que nous autres compatriotes, toutes sphères confondues, n’eûmes la décence et la courtoisie scientifique de l’honorer un jour, serait-ce pour sauvegarder cette vanité si chère à ce peuple d’Amazighs !? Pourquoi, sommes-nous passés maîtres dans cet art Machiavélique d’enterrer nos vivants durant l’apogée de leur gloire et tenter de les ressusciter une fois passés de vie à trépas : Autant chercher chez nous à résoudre la quadrature du cercle !... A cet effet, l’initiative première pour nous racheter passerait par la mise en place d’une fondation regroupant « inconditionnels à la Mémoire du Grand – Disparu » et œuvrant en prime à alimenter la bibliothèque national par le patrimoine culturel et scientifique hérité, pour ensuite intégrer cette richesse dans le cursus universitaire de nos jeunes générations à l’effet de les stigmatiser à perpétuer le chemin inaugural de leur philosophe aine : l’Anthropologue, psychanalyste et Politologue/ « Malek Chebel » modèle- phare à suivre… « Tous pour un et un pour tous », comme disait d’Artagnan » dans les trois (03) mousquetaires. Les premières boîtes du complément alimentaire dont le nom commercial est Rahmat Rabi (RHB) présenté, dans un premier temps, comme un médicament miracle contre le diabète, sont en vente depuis dimanche. Des pharmacies ont connu un rush ce début de semaine dans certaines régions du pays, comme à Biskra, Constantine, M’sila, etc. Cédé à 1760 DA et non remboursé, dont la dénomination est purement populiste, ce produit se vend déjà comme des petits pains. Le résultat d’une large campagne médiatique suivie du soutien indéfectible du premier responsable de l’autorité de santé, à savoir Abdelmalek Boudiaf. Une garantie supplémentaire pour les malades qui n’hésitent pas à se le procurer à n’importe quel prix. D’ailleurs, des pharmaciens interrogés affirment qu’effectivement, il y a une forte demande des patients de ce produit, mais «pour le moment il y a une hésitation à faire des commandes tant que les choses ne sont pas encore claires par rapport à l’autorisation de sa commercialisation et aux constituants de ce produit», nous confie une pharmacienne, qui estime que les autorités de santé doivent communiquer à ce sujet. Les grossistes en produits pharmaceutiques appréhendent pour le moment de faire des commandes. Si certains ont carrément décidé de ne pas le commercialiser, d’autres attendent pour voir. «Nous sommes submergés de demandes des pharmaciens. J’ai déjà une commande de 4000 boîtes de mes clients. Les pharmaciens subissent effectivement une pression des malades pour lesquels ils ne peuvent pas refuser la demande. C’est pourquoi l’avis de la haute autorité de santé est aujourd’hui indispensable pour trancher définitivement sur la fiabilité de ce complément alimentaire», estime un grossiste. D’autres affirment que les pharmaciens sont plutôt favorables à la commercialisation du RHB pour l’unique raison que les malades le demandent. Le Syndicat des pharmaciens d’officine (Snapo) met en garde contre la vente de ce produit en l’absence d’informations techniques et scientifiques. A l’issue de la réunion du bureau national tenu hier, le Snapo a saisi officiellement le ministère de la Santé, de la Population et de la Réforme hospitalière et le ministère du Commerce, pour demander des éclaircissement concernant l’autorisation de mise sur le marché et surtout les caractéristiques de ce complément alimentaire. «Le pharmacien ne peut pas conseiller au patient de prendre ce produit.» «Les pharmaciens sont appelés à respecter les procédures légales en matière de pratiques commerciales. Comme ils doivent veiller à avoir la traçabilité totale au sujet des approvisionnements qu’ils pourraient effectuer de ce produit», a déclaré Messaoud Belambri, le président du Snapo, qui n’a pas manqué de rappeler que dans le passé, des pharmaciens étaient déférés devant les tribunaux suite à la vente de certains produits (des vitamines) qui comportaient des excès de dosage de certains constituants. «On ne peut pas s’aventurer à vendre un produit dont nous ignorons tout et qui a bénéficié seulement d’une publicité par les médias et les réseaux sociaux. Aucune explication n’a été donnée ni par les pouvoirs publics ni par son producteur, alors qu’habituellement, des rencontres sont organisées au profit des médecins et des pharmaciens pour une meilleure connaissance du produit. Rien n’a été fait dans ce sens», a-t-il déploré. Pour Lotfi Benbahmed, président du Conseil national de l’éthique et de la déontologie et président du conseil national de l’Ordre des pharmaciens, il s’agit d’un complément alimentaire qui n’a donc par définition aucun effet thérapeutique, comme des milliers d’autres produits de cette catégorie : «Ce sont des produits dont l’effet rejoint l’effet placebo et n’ont aucun intérêt pour la santé publique. Cependant, présenté dans un premier temps comme un médicament miracle, sa commercialisation pourrait conduire des patients diabétiques à abandonner leurs traitements. Ce qui constitue un risque sanitaire réel pour une pathologie qui mobilise des efforts considérables de la part du corps médical et des caisses de Sécurité sociale (dépistage, consultations, remboursement de bandelettes et médicaments).» M. Benbahmed estime que «le fait de vendre un produit qui ne sert à rien à plus de 1700 DA et non remboursé constitue dès lors pour les malades une véritable escroquerie». L’Ordre des pharmaciens, a ajouté M. Benbahmed, se réunira jeudi pour justement débattre de ce point. Un communiqué destiné aux pharmaciens sera adopté afin de leur «recommander de se rapprocher de l’ensemble de leurs patients diabétiques pour les informer au mieux sur ce produit et surtout pour leur rappeler la nécessité, dans cette pathologie, de poursuivre avec rigueur les prescriptions de leurs médecins». La communauté médicale est quant à elle formelle : il n’y aura pas de prescription de ce produit dont les preuves scientifiques n’ont pas été démontrées. La star de la chanson malienne, Salif Keïta, a offert dimanche à Constantine, lors de la deuxième soirée du festival international Dimajazz, un «déluge» de sonorités africaines, dans une parfaite harmonie entre musique moderne et mélodie mandingue. Fidèle à son statut, la voix du rossignol, qui a rapidement conquis la salle de spectacle Ahmed-Bey, qui a enregistré à cette occasion une forte présence d'étudiants maliens ayant fait le déplacement pour admirer leur idole, a ravi toute l'assistance avec ses rythmes et sons puisés de plus de cinquante ans de carrière. Pendant près d'une heure et demie, Salif Keïta, qui a porté haut l'étendard de la musique africaine en général et celle du Mali en particulier, a su relever le défi de faire danser le public du Dimajazz sur le son de la kora et des percussions africaines, interprétant des chansons de son dernier album «Talé» et d'autres plus anciennes. A l'aise sur scène, Keïta a entonné C'est bon, c'est bon, Da, Nathy et d'autres tubes dans un tempo intense et enivrant, enveloppé dans des sonorités africaines, soul et jazz raffinées, rappelant la diversité des sons africains. Accompagné par des musiciens déchaînés, le chanteur a clôturé son tour de chant avec le titre Madan, transportant ses fans vers un état d'euphorie exceptionnel. A l'issue du spectacle, Salif a fait part de son «immense joie» de participer pour la première fois au festival international Dimajazz, soutenant que la musique est le «langage qui unit les peuples». La première partie de cette soirée a été animée par le Cairo Jazz Station qui a fait voyager l'auditoire au son du saz et de l'accordéon, entre les deux rives de la Méditerranée à la recherche d'une nouvelle identité musicale commune. Le saz d'Abdallah Abozekry (Egypte) et l'accordéon du portugais Joao Barradas ont accompagné les percussions du Turc Ismael Altunbas et la contrebasse de Loris Lari (Italie) pour offrir un mariage de timbres inédit, au grand bonheur d'un public conquis par cette fusion sonore, longuement applaudie. Le Dimajazz, qui se poursuit jusqu’au 24 novembre courant, accueillera lundi la très attendue Martha High, surnommée la diva du soul, avec, en seconde partie, Djamel Sabri dit Djo et son groupe Les Berbères. Vous voulez Cherchez des articles scientifiques à partir d'un seul moteur de recherche. L'initiative de la Semaine mondiale de l'entrepreneuriat (Global Entrepreneurship Week) a été lancée en 2008. Depuis, elle est célébrée chaque année durant une semaine dans plus de 150 pays à travers le monde. A l'instar de ces pays, l'Algérie a organisé durant cette semaine diverses manifestations sur l'ensemble du territoire national traitant de thématiques intéressantes, destinées en particulier aux étudiants. Ces rencontres constituent donc des espaces de réflexion et d'analyse pour proposer des méthodologies afin d'aider nos étudiants à trouver leur aventure dans le monde de l'entrepreneuriat et notamment la nécessité d'ancrer une culture entrepreneuriale en milieu universitaire. Pourquoi faut-il éduquer à l'entrepreneurship dans nos universités? Le développement économique et social de notre pays dépend de sa capacité à créer et à développer des produits et services nouveaux. La création d'activité et la création d'entreprise participent ainsi pleinement à ce processus, et il est indéniable que que nos diplômés de l'enseignement supérieur soient associés dans cette nouvelle dynamique de culture entrepreneuriale, notamment dans l'accompagnement et le suivi des porteurs de projets. Comme la plupart des disciplines qui appartiennent aux sciences de gestion et management, aux sciences sociales, etc..., l'entrepreneuriat peut faire l'objet d'un enseignement académique en Algérie. De tels enseignements existent de par le monde, l'Algérie avec son potentiel en termes d'infrastructures universitaires, peut dispenser cette formation qui fait cruellement défaut et peut répondre ainsi aux objectifs exprimés par les pouvoirs publics. Ces objectifs concerneront avant tout, d'éveiller et de sensibiliser les étudiants diplômés ou en fin de cursus qui envisagent à très court, moyen ou long terme de créer leur propre entreprise pour les aiguiller et les orienter à l'effet d'avoir une vision claire sur la création d'entreprise, une option de carrière et développer ainsi en eux des attitudes favorables par rapport à des situations entrepreneuriales. à ce niveau, il s'agira de mieux préparer nos étudiants à réfléchir, à analyser et surtout agir dans des situations en tant qu'entrepreneurs. Au stade des recherches actuelles, nous pouvons dégager trois niveaux d'intervention: le premier niveau consiste à dispenser des enseignements de sensibilisation et d'initiation à l'entrepreneuriat, · le second niveau, concerne l'enseignement de formation à la création d'entreprise et à la gestion du projet, · et enfin, le troisième niveau est l'accompagnement des étudiants porteurs de projets de création d'entreprise. Toute action visant à introduire un enseignement en entrepreneuriat dans nos universités doit être faite à partir d'une définition claire et précise,suivant des orientations prioritaires et surtout des catégories des populations des étudiants ciblées. L'enseignement de l'entrepreneuriat peut être un instrument pédagogique; c'est-à-dire un moyen d'apprendre autrement de façon à ce que l'apprenant (étudiant) découvre ce qu'est l'entreprise et son environnement en partant d'un projet de création d'entreprise. Un instrument promotionnel de la politique d'emploi; conçu comme un moyen de créer des activités, des entreprises et surtout de l'emploi et de participer au développement économique dans un territoire. Un instrument académique, un moyen de développer un nouveau corpus de connaissance et pourquoi pas à terme une nouvelle discipline. Il est impératif de bien mesurer toutes les implications et contraintes organisationnelles relatives à des orientations et décisions portant sur la mise en place et le développement des programmes d'enseignement de l'entrepreneuriat dans nos universités, notamment celles relatives à la prise en charge d'un projet stratégique, à savoir une volonté clairement affichée et affirmée des institutions et pouvoirs publics qui doivent être impliqués dans ce processus. La création d'entreprise ne s'improvise pas. La combinaison entre la formation et l'entrepreneuriat est récente. L'entrepreneurship est né dans les universités américaines dans les années soixante, considéré comme un nouveau concept pédagogique et qui consiste à promouvoir sous différentes formes, en particulier dans l'enseignement, la démarche à créer sa propre entreprise et surtout créer son propre emploi. Le système d'enseignement supérieur en Algérie est un système public. L'éducation est accessible à tous. La présence d'un grand nombre de diplômés universitaires chaque année sur le marché de l'emploi se heurte aux nombreuses difficultés rencontrées par les pouvoirs publics d'absorber cette masse importante de diplômés pour juguler la problématique de l'emploi dans notre pays. Face à ces défis, l'un des objectifs majeurs réside dans la préparation des ressources humaines qualifiées et performantes de demain. Elle consiste également à trouver une meilleure solution pour mieux orienter et surtout adapter l'offre aux besoins du marché. En outre, un autre facteur déterminant, à notre sens qu'il va falloir prendre en considération durant ce cycle de formation, d'allier la théorie à la pratique pour leur permettre de s'imprégner des réalités entrepreneuriales dans notre pays. Le problème d'infrastructures ne se pose pas chez nous. Les pouvoirs publics doivent d'ores et déjà réfléchir sur l'encadrement de ce nouveau métier promis à un bel avenir dans notre pays. Pour concrétiser cette action, il y a lieu d'associer toutes les parties prenantes, en l'occurrence les ministères suivants: de l'Enseignement supérieur et de la Recherche scientifique, la Formation professionnelle, de l'Industrie et des Mines, du Travail, de l'Emploi et de la Sécurité sociale par le biais de ces nombreux dispositifs en faveur des jeunes. Dans cette optique, il y a lieu de préconiser l'installation urgente d'un Observatoire national chargé du dispositif de soutien à l'entrepreneuriat au profit de nos étudiants et piloté par Monsieur le Premier ministre qui accorde un intérêt particulier à la jeunesse algérienne à travers ses différentes rencontres et briefings avec les étudiants lors de ses déplacements dans les wilayas du pays. Qu'en est-il dans d'autres pays? Malgré que le classement de l'Algérie s'est amélioré cette année, au 73ème rang mondial sur 173 pays en matière de promotion de l'entrepreneuriat selon le Global Entrepreneurship index 2017 publié cette semaine par le Global Entrepreneurship & Development Institute (Gedi), l'Algérie a enregistré quelques avancées en matière de perception de l'entrepreneuriat par la société, il reste tout de même insuffisant par rapport aux attentes des pouvoirs publics. Les objectifs de l'enseignement à l'entrepreneuriat dans certains pays se focalisent principalement entre deux volets et qui sont complémentaires, à savoir: le développement de l'esprit d'entreprendre et le développement socio-économique durable. La crise actuelle que traverse notre pays nous pousse à rechercher des solutions efficaces parmi celles-ci, l'entrepreneuriat est perçu comme une très bonne réponse, notamment face aux problèmes de l'emploi que connaît notre pays. Il est aujourd'hui possible pour nos étudiants de créer leurs entreprises à travers les différents dispositifs initiés par les pouvoirs publics, l'Algérie n'a rien à envier à personne en termes de talents et d'idées. Créer sa propre entreprise en période de crise n'est donc pas insensé et peut même se révéler payant. De nombreuses entreprises parmi les plus florissantes ont ainsi vu le jour sous des cieux orageux, de Microsoft à FedEx, en passant par Burger King, Procter&Gamble, Mc Donnald's, General Electric ou Apple, démontrant qu'une mauvaise conjoncture ne doit pas brider les ambitions. Quelles sont selon-vous les préconisations à entreprendre pour enseigner l'entrepreneuriat dans nos universités? Il serait dans un premier temps judicieux que les pouvoirs publics affichent une vision claire concernant le rôle de l'entrepreneuriat en Algérie, d'une part, et de mettre en place une plateforme nationale pour l'entrepreneuriat des diplômés universitaires par l'élaboration d'un programme sur l'entrepreneuriat pour toutes les universités, instituts, écoles supérieures, centres de recherche, etc...à l'instar des pays émergents. Les préconisations que nous proposons tiennent comptent des diverses expériences pratiques enregistrées dans ce domaine. · les préconisations relatives aux leviers institutionnels et aux ressources. · créer une structure de promotion et de développement de l'enseignement de l'entrepreneuriat dans le système éducatif. · créer un observatoire national des pratiques pédagogiques en entrepreneuriat. · créer un comité national de l'enseignement en entrepreneuriat pour donner plus de poids et intérêts eu égard aux enjeux socio-économiques de notre pays, en faisant participer les pouvoirs publics d'un côté et les acteurs du secteur privé, à savoir les associations patronales, les associations professionnelles et certaines entreprises qui se sont distinguées de par leur compétitivité sur le marché national. Ce comité servira de passerelle entre le monde de l'enseignement et de la recherche d'une part, et le monde professionnel, d'autre part. · créer une association dite «académique» pour l'enseignement et la recherche en entrepreneuriat, cette association peut regrouper à titre d'exemple enseignants et chercheurs en entrepreneuriat, consultants ayant une compétence avérée dans l'entrepreneuriat. · organiser un séminaire d'information et de sensibilisation à l'échelle nationale axé sur la formation à l'entrepreneuriat qui permettrait aux participants (universités, instituts et écoles, etc...) et de réfléchir ensemble pour identifier les pistes d'actions possibles et de faciliter les démarches d'implémentation des universités. · identifier et former aux spécificités de l'entrepreneuriat «des enseignants pour développer les matériels pédagogiques et participer au bon fonctionnement des réseaux régionaux». Cette façon de faire, va permettre d'accroître la professionnalisation d'un corps spécifique d'enseignants chercheurs. Il demeure entendu qu'une telle action sous-entend la formation de formateurs qui fera l'objet d'un suivi régulier et planifié par l'autorité de tutelle. · organisation par la tutelle chaque année «d'une compétition nationale» des projets de création d'entreprise par des étudiants (es) des universités, écoles et instituts et récompensé par un prix national. · impliquer les étudiants, les chefs d'entreprises et les consultants en la matière en leur proposant des formules d'association (exemple: club, cellule de développement,...) pour faire vivre les enseignements en adéquation avec le tissu économique local. · rechercher des partenaires actifs sur des programmes d'enseignement avec d'autres universités étrangères pour partager et échanger les expériences et l'expertise. · des bourses aux étudiants pour suivre un programme de formation à l'entrepreneuriat dans les universités étrangères. · organiser au moins une fois par «un colloque sur la création d'entreprise», avec la participation de tous les acteurs qui sont en relation directe ou indirecte avec la création et le développement de l'entreprise en Algérie.